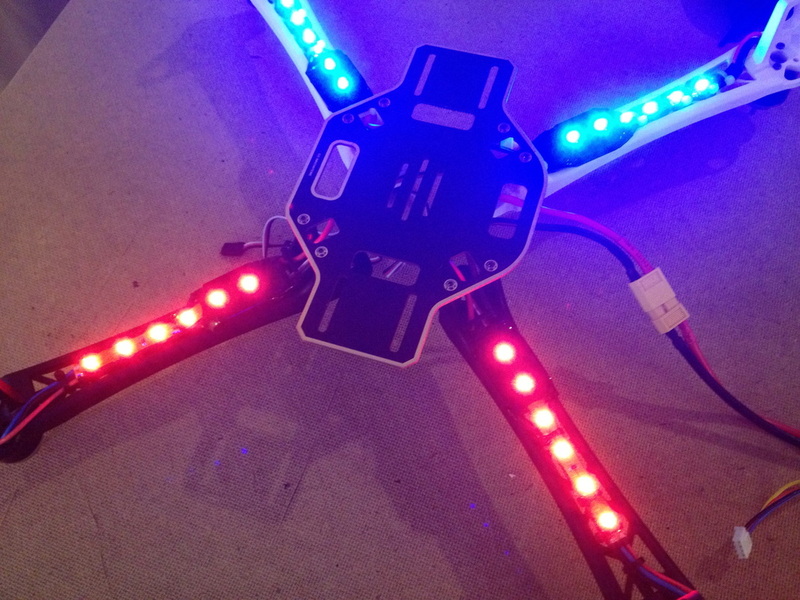 After I had assembled the frame of the quadcopter, I decided that I wanted to add in a lighting system. I mainly wanted to do this so that it would help in orientation when I am flying far out as well as when I'm flying in low light conditions. Below, you will find two different versions I went through before I settled on a lighting system I liked. 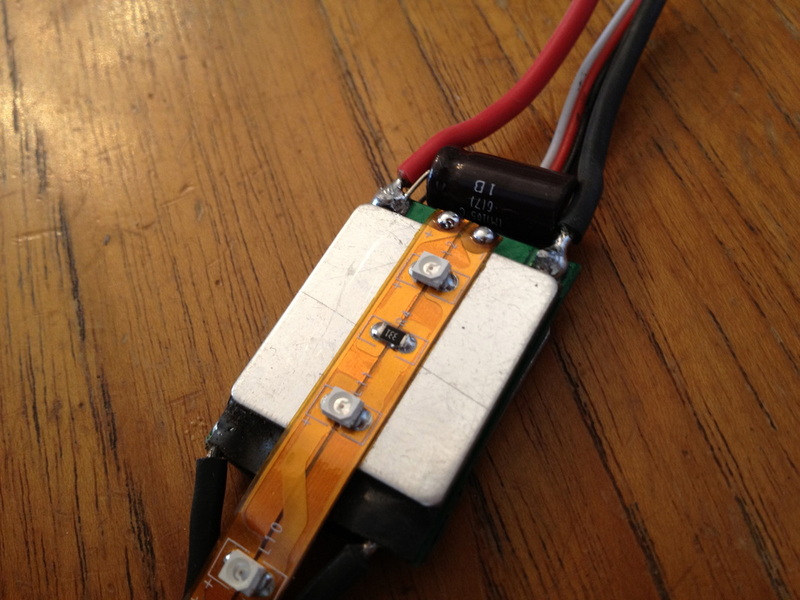 Version 2 is the latest version and it uses a method of integrating the LED's into the ESC. After the initial lighting system I created, I decided it was a little more practical to have the lights stay on at full power rather than have them dim proportional to throttle. 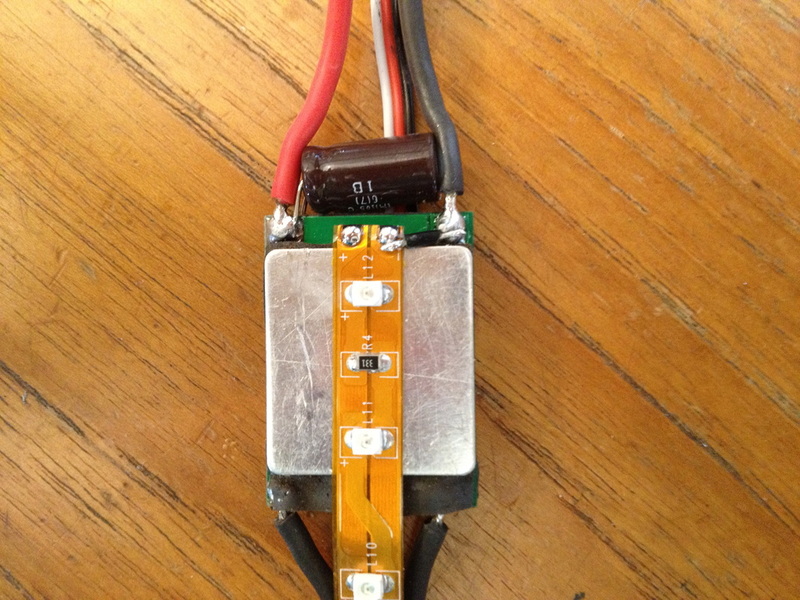 In order to fit 6 LED's under the arms, I needed to have a few of them overlapping the ESC. 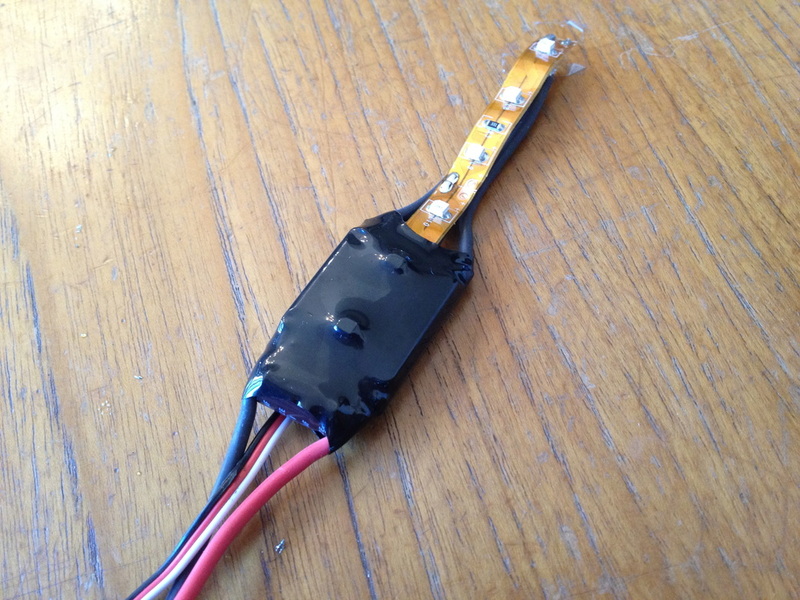 I lined up the contacts for the LED strip with the power wires of the ESC and then used small jumper cables to connect them together. 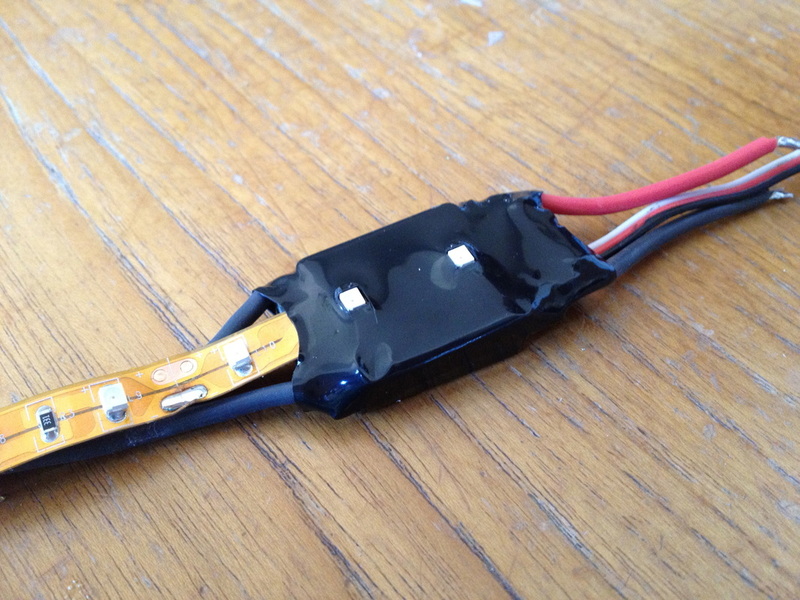 After the jumper wires were securely in place, I used some black heat shrink to cover the ESC and the LED's. 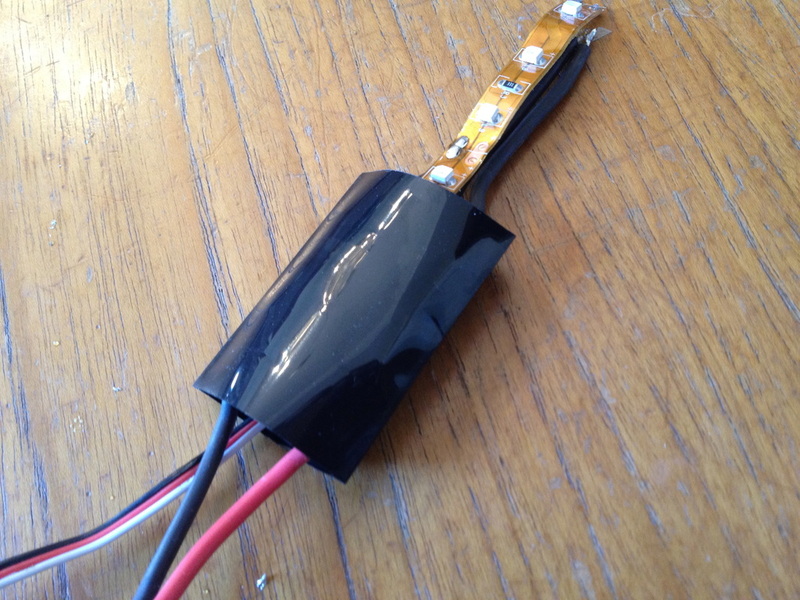 Next, using an exacto, I carefully cut small holes in the heat shrink for the LED's to protrude through. 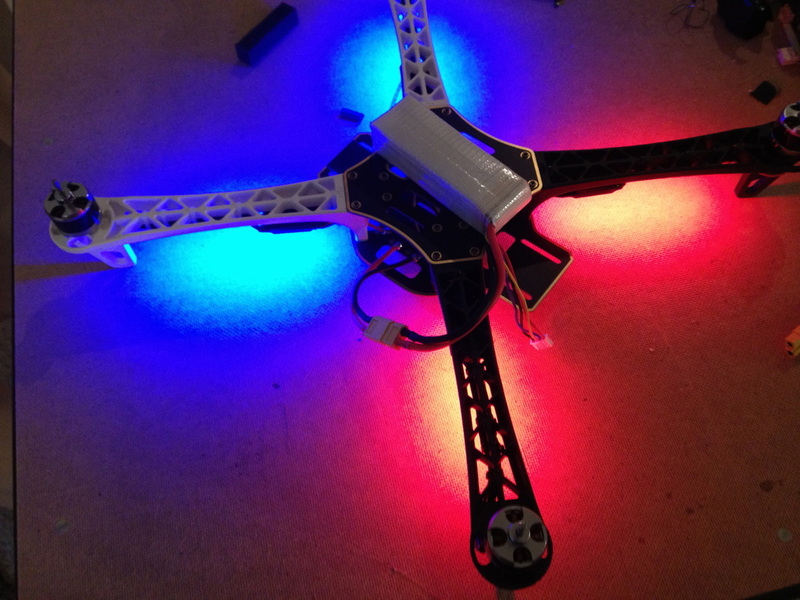 I completed this process for all four ESC's using red LED's for the back arms and blue LED's for the front arms. After I had made all the connections between the Motor and ESC's, this is what the quadcopter looked like with the LED's on. For my quadcopter, I wanted to put the lights under the arms, but because the motor bullets were there it made it very difficult to mount. I experimented with other locations, but none of them were as effective as mounting them on the underside of the arm. I eventually came up with a solution that not only allowed me to mount the LED's to the underside of the arms but also allowed them to dim and brighten proportional to my throttle input. The first thing I did was open up each of the ESC's by removing the heat shrink and pulling away the two heat sinks on either side. 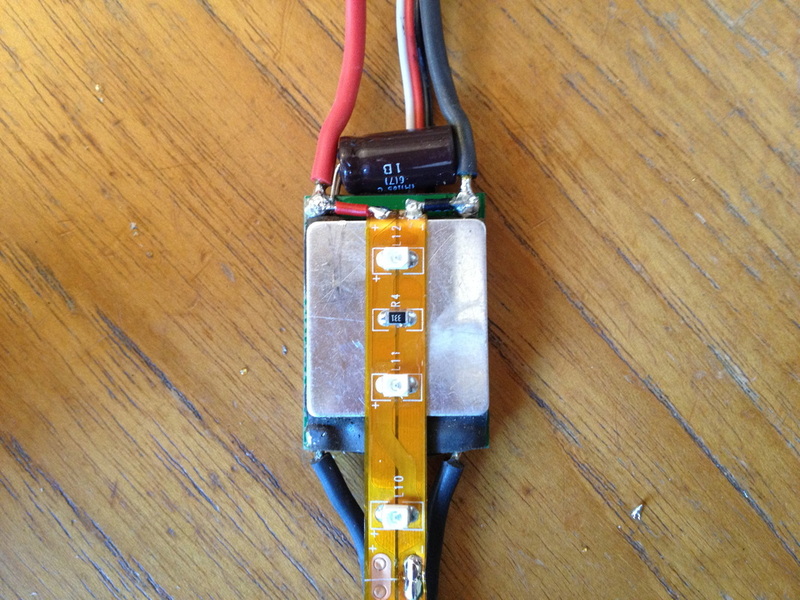 This allowed me to connect a HobbyKing LED Light Strip directly to two of the three motor outputs on the ESC. This connection is what allows the LED's to dim and brighten proportional to throttle input. An explanation of how this works: the ESC sends out pulses of electricity through each of its wires at a very high frequency - this is what makes the motor spin. By connecting the LED's to this same output, the LED's will pulse on and off at the same frequency as the the motor. Because this frequency is so high, it appears as if the LED's are dimming as the pulses slow down and brightening as they speed up. See the video below for a demonstration. After I had soldered in the LED strip, I stuck the heat sinks back into place and then reapplied some black heat shrink around the ESC. 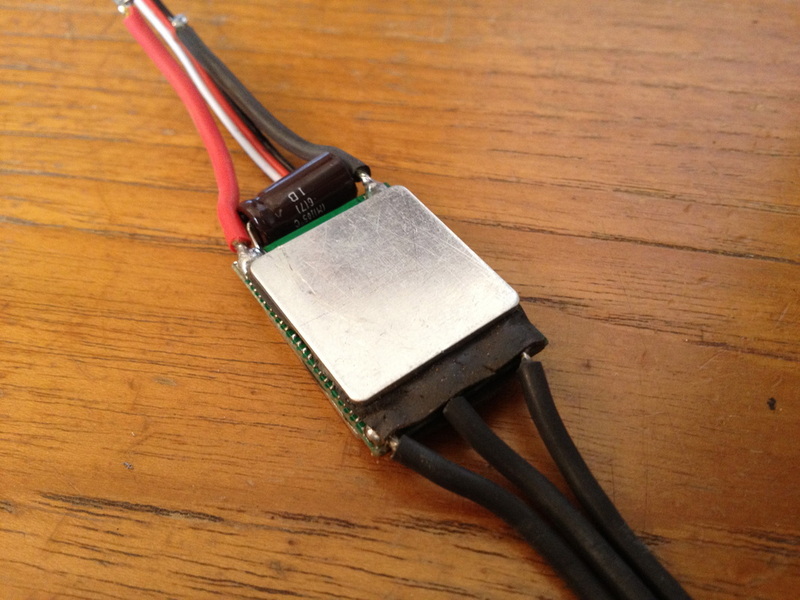 In order to get around the mounting problem, I decided to remove all the bullet connectors on my ESC's and motors and instead use a direct solder connection. 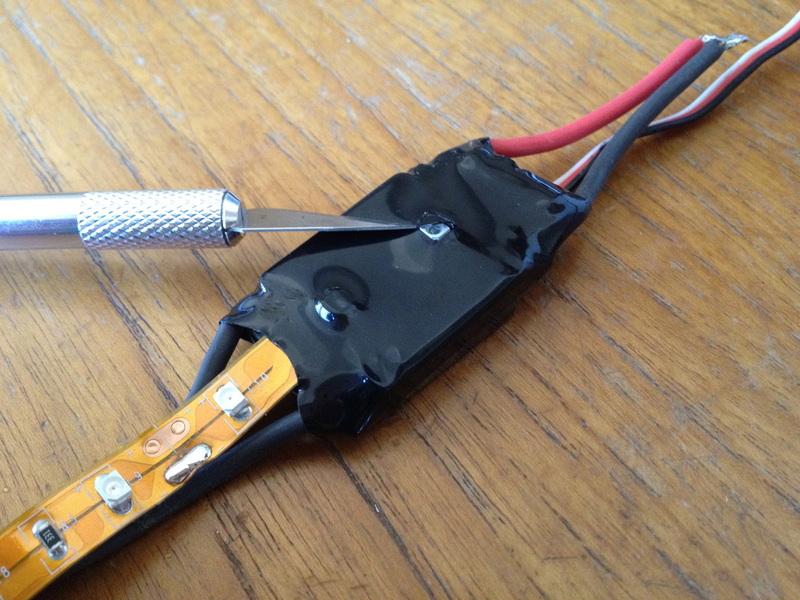 By doing this, it became possible to mount the LED's on top of the motor connections using zip ties to hold them down. After the main strip had been zip tied in place, I made a small extension of 3 LED's on the tip of the arm to help even further with orientation.